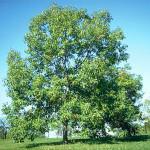 A beautiful native tree with lustrous heavy textured green leaves. Stiffly pyramidal form in youth, becoming a broad open, rounded crown with age. Yellow to red-purple Fall color. Long lived. Range of soil types, including damp sites. Not tolerant of salt or air pollution. Long lived. Easy to transplant. 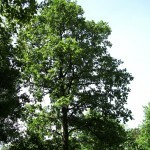 Also known as Hill’s Oak, Yellow Oak, and jack Oak. Native to northern Midwest United States. 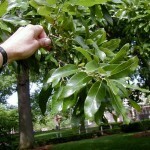 Similar to the Red oak but does not get as large and is heavier-branched. 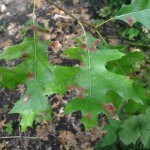 Simple, sharp-lobed leaves turn reddish in the Fall. Intolerant of shade. Prefers dry, acid, sandy soil, but tolerates heavier soils. Yellow inner bark. Native tree for prairies and oak savannahs. Bold, foliage. More tolerant of city conditions than most oaks. Corky bark of great Winter interest. 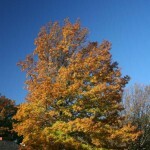 A deciduous oak of the Red Oak group. Broad pyramidal crown. Smooth, brown-gray bark. Primarily native to Midwest and mid-Atlantic states. Yellowish-green flowers as the leaves emerge in Spring. Rounded acorns. 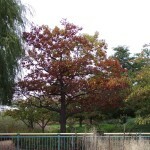 Glossy dark-green leaves turn deep red in Fall. 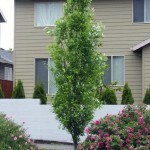 Excellent as a street and landscape tree. With its strong branches and interesting leaves, the chinkapin oak makes a beautiful statement. 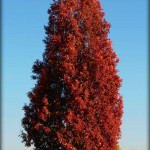 This conversation piece of a tree is worthy of a prominent place in any larger lawn, estate or park. The magnificent oak also adds to the ambiance by drawing a variety of wildlife with its acorns. In fact, chinkapin acorns are the food of choice for many animals. A columnar to narrow-oval cultivar that is the result of a cross between Q. robur ‘Fastigiata’ and Q. bicolor. 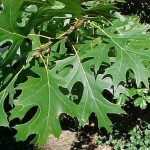 Glossy, leathery, dark green foliage with soft, light underside. Excellent resistance to powdery mildew. Excellent winter hardiness with resistance to wind and ice. Yellow-brown Fall color. Excellent as a specimen, in small groups or as a tall screen. Oval to elliptic acorn fruit. Rounded, pyramidal native tree. Upright spreading branches. 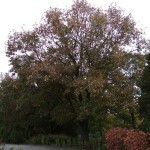 Fast growing oak suitable for lawns, parks, and commercial sites. Transplants better than most Oaks and is pH tolerant. Prefers acidic conditions. Excellent red Fall color. Dark green, leather leaves turn orange to red in Fall. Rapid growth rate. Pyramidal habit when young, becoming oval-rounded to rounded with age. Drought and urban tolerant, with adaptable pH. 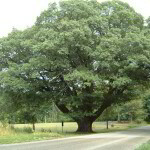 Excellent for use as a shade tree in large areas, or as a specimen tree. Long lived.